Historically, there have been an enormous number of people that have revealed their fondness for Oriental and Persian rugs, some of whom are very well-known. Yet, during the earliest periods of rug weaving, only monarchs and others of nobility were able to access the splendor of highly-stylized and finely crafted carpets. In the past few centuries, however, they have become more obtainable for the average person, sometimes taking years or even a lifetime to curate. Such is the case with the famous rug collector Sigmund Freud. Referred to as the father of psychoanalysis, Sigmund Freud was an Austrian neurologist who began his career researching cerebral palsy, aphasia and microscopic neuroanatomy after qualifying as a doctor of medicine at the University of Vienna. Psychoanalysis, for all intents and purposes, is the clinical method of carrying out a therapeutically-centered conversation between a psychoanalyst and their patient for the purpose of treating mental illness. The practice quickly became popular in a budding psychology movement at the time, and eventually altered the entire landscape of psychiatry where it is still being put into practice today. 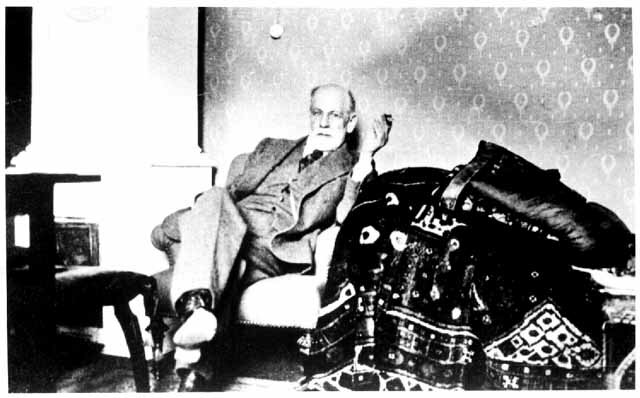 Though, while Freud had a profound interest in his research and its applications, his personal life included a deep fascination with a variety of antiquities, particularly Oriental and Persian rugs. When Sigmund Freud arrived in London after moving from Vienna in 1938, he brought with him a vast collection of rugs he had accumulated over many years. While there has been some speculation as to why he was so interested in obtaining these carpets, many who knew Sigmund personally considered him a cultured individual who was well educated in non-Western traditions and customs. In fact, along with his passion for Oriental and Persian rug artistry, his collection also included items such as Hindu and Buddhist statuettes, as well as Egyptian and Greek artifacts. A wise collector, Sigmund Freud amassed a particularly fine assortment of rugs manufactured around the world. Indeed, many of the rugs in his collection are considered some of the best examples of Oriental and Persian rugs being displayed in European homes during this period, mostly consisting of 19th century handiwork originating from both tribal villages and notable rug-making cities. As the image below shows, Freud’s affection for these carpets went beyond merely collecting them, as they were on permanent display in the very room where he labored, seemingly playing some role in his work with patients. These items are today found at the Freud Museum in London, where over 20 carpets originally owned by the psychoanalyst and pioneering doctor are either on exhibit or in climate-controlled storage. Together, these rugs demonstrate a sincere insight into the personal life of someone who spent his career delving into the personal lives of those he treated. Do you have a favorite Oriental or Persian rug? If not, be sure to check out our inventory of both antique and modern carpets from around the world. You can also contact one of our specialists who will walk you through the entire process of having your rug appraised. Also, as you may already know, the value of your rug can rise dramatically based on its condition, making it imperative it be regularly cleaned or repaired in order to keep it looking its best. If you’d like to see your rug in person, visit our showroom.